The traditional pies are great. Rustic and hearty, frying leaves the dough wonderfully chewy, and the insides bursting with flavor. If you are wary of the blood sausage, you needn’t be; One of our housemates ate four of the pies in quick succession, raving about them, and was shocked to learn that they contained black pudding. The spices further improve what would be a wonderful recipe on its own. I used Aleppo pepper, and loved the middle eastern spiciness of it. If you too add spicy pepper to your filling, then you may find that our Milk Tea is a wonderful counter to that heat. The modern pie is amazeballs. Truly. It took me about three glorious bites to even be able to think about additional adjectives. The smidge of garlic on the bottom of the filling was planted, grown, and harvested purely to complement the chevre. The leek was lovingly tended by orphans of the Greenblood who sang to it daily, until the time came for it to join the other ingredients in this tart. The black pudding, the center of the whole dish, stands firm amidst the other flavors, allowing them to complement, rather than overpower it. You may think the addition of the pistachios strange, but they lend a bit of crunch to an otherwise creamy dish, and help bring out the subtle nuttiness of the crust. Nibbled on its own, the crust has a nice, dry earthiness. However, it softens as it soaks up moisture from the filling, and adds to the overall gloriosity of the whole. The two recipes are too dissimilar to compare fairly. I loved them both equally, albeit for their separate merits. I’d say that the traditional pie is the most Dothraki, but although the modern tart moonlights as a dainty and proper dish in its fluted tart pan, it’s absolutely one that Ser Jorah could dig into with both hands. Since most black pudding comes in 1 lb. packages, I suggest making both! Known as Khuushuur in Mongolia, these meat pies are traditionally made with horse meat, or with lamb, goat, or beef. To satisfy the “blood” part of the description, I’ve opted to use blood sausage for half the meat. For a series of photos of a Mongolian woman (in… leopard skin?) making these pies, check out this post. I also strongly recommend washing these pies down with Milk Tea. Mix the ingredients for the dough, tweaking the amounts of flour and water as needed until you have a nice smooth ball of dough. Divide the dough in half, and roll each half into a rope about a foot long. Cut these ropes into 5-6 pieces, which will give you a total of 10-12. On a floured surface, roll out each piece of dough into a thin circle, about 5-7″ across. Repeat with all remaining dough and filling. Meanwhile, heat about 2 inches oil over medium-low heat to 350°F in a deep pot. Fry pies, several at a time, until golden and meat is just cooked through, about 5 minutes. Transfer to paper towels to drain. Combine the ground pistachios, almonds, and flours in a large bowl, along with a pinch of salt. Rub in the butter until the mixture resembles coarse crumbs. Add the egg and mix thoroughly. Depending on the size of your egg, you may or may not need to add a splash of cold water to bring the mixture together. Press the dough into a flat disc between plastic wrap, and chill for 30 minutes. Press the chilled dough into your tart pan, making sure to spread it evenly at a depth of about 1/4″. Prick the bottom of the pan all over with a fork to keep the dough from bubbling up. Bake for 15 minutes, or until the edge starts to pull away from the pan, and is just shy of browning. 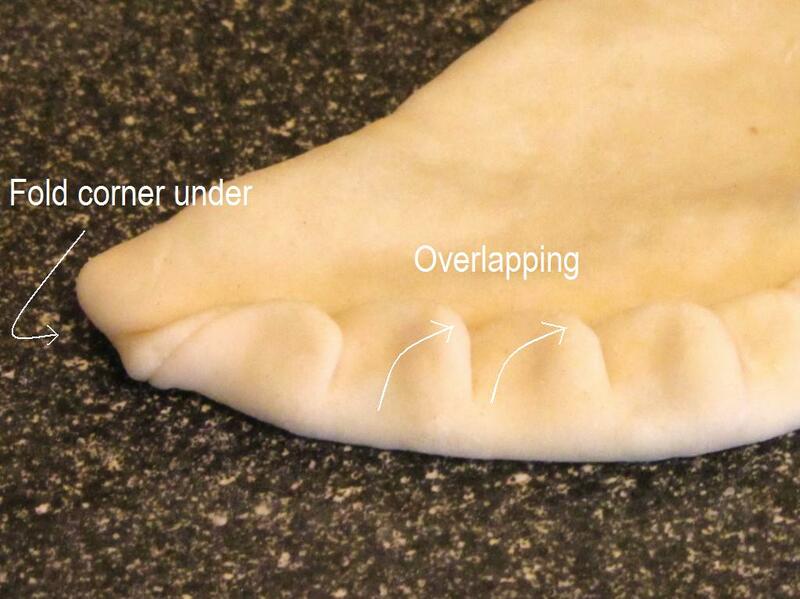 While the crust is baking, prepare the filling. Heat the olive oil in a skillet over medium heat, and cook the leeks for about 3 minutes, or until they are tender. Add the garlic and stir for another minute. Set aside and allow this mixture to cool. In a separate bowl, mix the eggs and cream with the goat cheese. When the crust is finished, sprinkle the garlic-leek mixture over the bottom of the crust. Follow this with the sliced blood sausage, then the cheese mixture, making sure to distribute evenly. Bake for 30 minutes, or until the filling has set. Allow to cool slightly before serving; Best eaten warm. Amazeballs is my new favorite word. Where did you find blood sausage? Ordered online? I know they’re available on Amazon (of course), but we’re lucky enough to have a few shops in Boston that carry it. Market Basket often carries it if you’re in New Hampshire or Massachusetts. In Argentina you can find blood sausage in any butcher shop. Maybe in the imported section of your supermarket? Are you sure about the boudin? Traditional Boudin includes alot of rice, and even more spices. Interesting! The only boudin I’ve had was light on any rice, and pretty closely resembled UK black pudding. I imagine that a spicy, ricey boudin would still suit the traditional version very well, although perhaps not the modern one. Ahh, that makes sense. I am certainly thinking of Cajun Boudin since that is what we have down here. I must say that both of them do sound very tasty, although my stomach tends to favor the traditional one; I always loved the individual-sized meat pies. That seems truly fabulous. I love black pudding, so I think I may try to do that recipe next time I head home. ^^ Thank you! Aha. I went a little link crazy on this one, but apparently I can’t link to a photo the way I thought. I’ve pasted it into the post, instead. I’ll look forward to hearing how you like the pies! Do you know which version you’d like to try? Nummy!! This looks great and I look forward to trying it!! Tried the traditional recipe, had to increase the amount of flour to make a stiffer dough but otherwise worked great. One word of warning, the stuffing is VERY rich so be sparing! Otherwise reminded me of a samosa, one of my favourite foods. do you need to cook the filling first or just put it in raw ? It goes in raw to both recipes. Does the blood sausage in the traditional blood pie need to be diced small like everything else. There is no instructions on the prep for the filling. When I made it, I just peeled the skin off, and used it like sausage meat. Awesome! Which version did you try? Quick question here : When you ask for a cup of – for instance – pistachios, then add “finely ground”, does you mean to take a cup of ground pistachios, or is it a cup of whole pistachios that you’ll grind ? Oh wow. Definitely going to make some of these tonight! Not surprised to learn that they’re delicious, though; blood sausage is one of my favorite foods, and I’m lucky enough to live around a large Polish population, so there’s a butcher a block from my home that carries a regular supply. Thank you for the lovely recipe! I tried the traditional version, but included some choped spring onions in addition to the regular onion (because in Argentina, and probably in Spain too, spring onions are a classic within the sweet variety of argentian-basque black pudding, here called morcilla). The result was delightful!